Flint, Michigan is getting a new OHL team next season. Earlier in the year there was speculation the team might be named for a fictional basketball team called the Flint Tropics from a Will Ferrell movie. We even saw a Tropics concept back in February. But what Dylan Alexander offers up today is a thing of pure beauty. 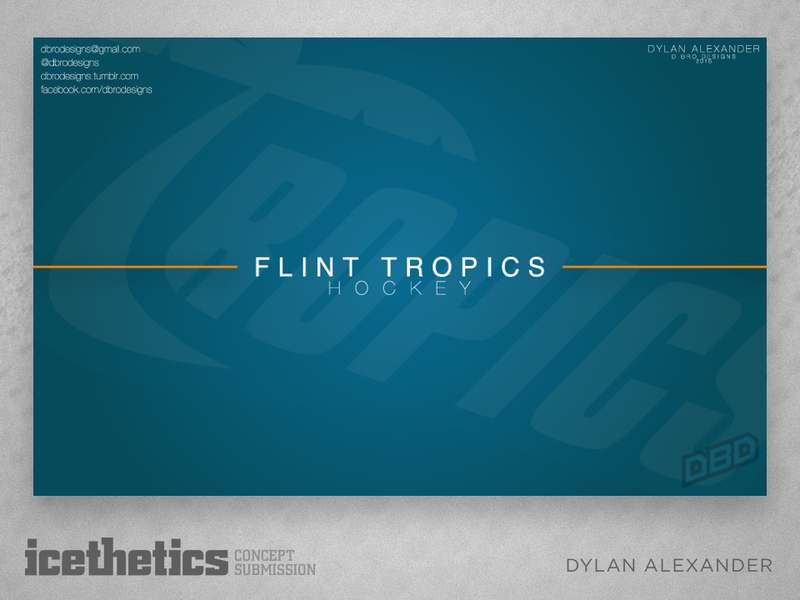 He didn't just design a Tropics logo. He designed several. He didn't just design a Tropics jersey. He designed several. And if all that wasn't enough, he's got merchandise and a center ice paint job for Flint's Perani Arena. The 2015 NHL All-Star Game is now a week away. The jerseys are out and the reviews from fans are by far and away... let's call them weak. 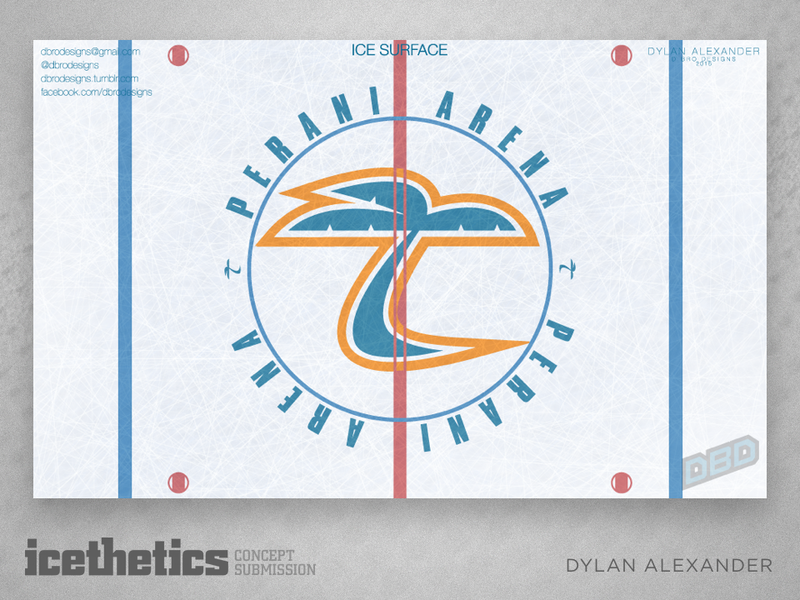 So the talented Dylan Alexander has taken a stab at a handful of alternate designs. To start, he assumes black and neon green are a deal breaker. Assuming those are the colors they had to use, here's how they could work. Many other fans have suggested the All-Star uniforms should match the host team's colors. 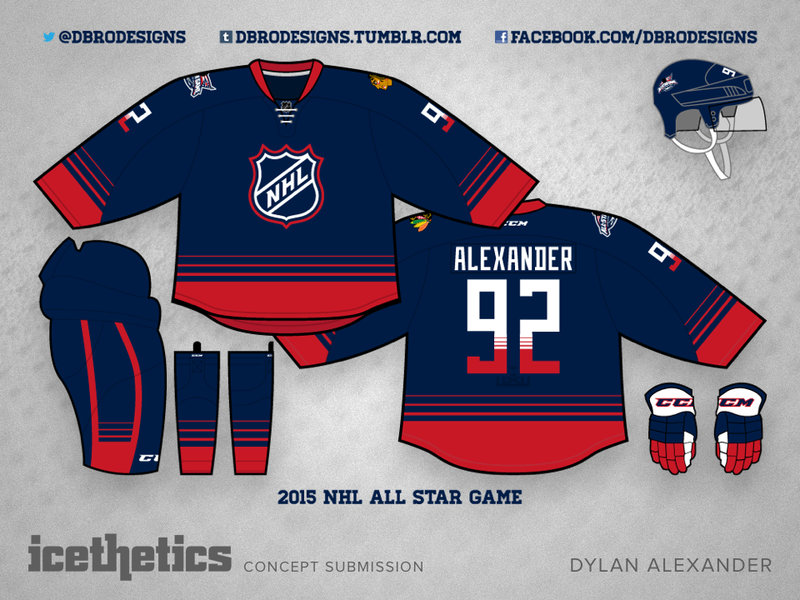 In that case, here's Dylan's design in navy and red. Now that's sharp. And since neon green was technically one of the Blue Jackets' colors for many years, here's that design once more with green as a nice accent. Think that could be a winner! I thought we'd revisit some past Sunday series over the next few weekends. Today, we get a look at a collaboration between two frequent contributors who were not featured this past week. 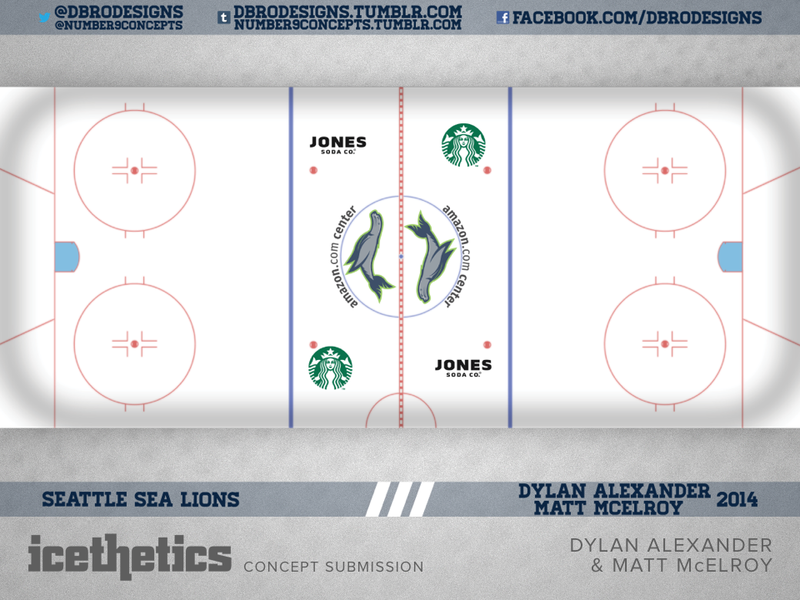 Dylan Alexander and Matt McElroy collaborated on this complete branding package for a Seattle expansion team named the Sea Lions. I'm kicking off a new Saturday series today that focuses on college hockey. Many of you have asked for it and some great designs have started rolling in. 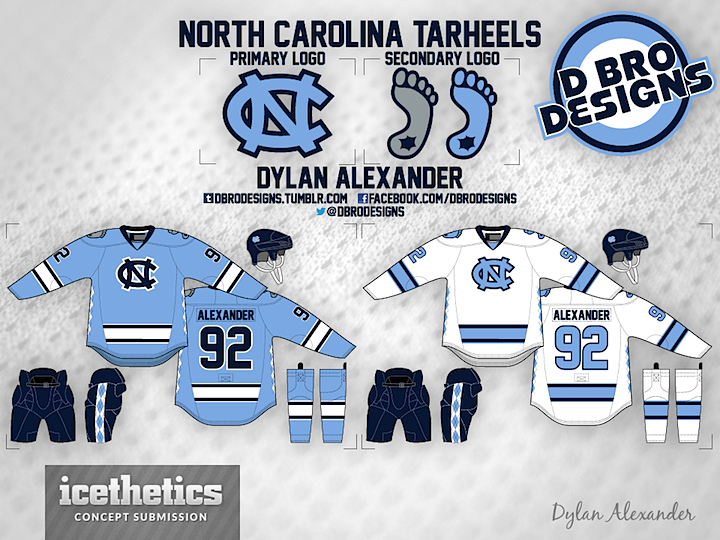 This one for the University of North Carolina was actually sent in last year by Dylan Alexander. I'm happy to finally share it. You guys also asked me to include photos of what the school's existing hockey uniforms look like to compare with the concept art. Being a southern school, it's not surprising that ice hockey is merely a club sport at UNC. But I did find some photos on the club's Facebook page. Dylan Alexander is a frequent contributor with a distinct style and he's the next to be featured in this special week of concept posts. 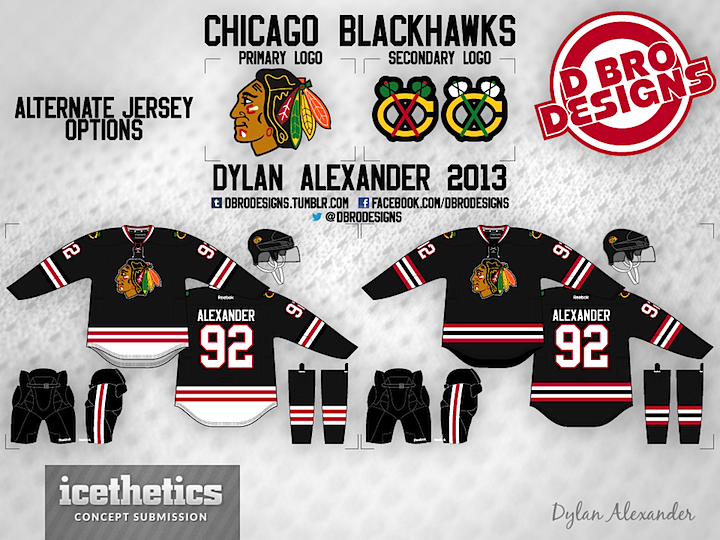 First we get a look at some third jersey options for the Blackhawks. 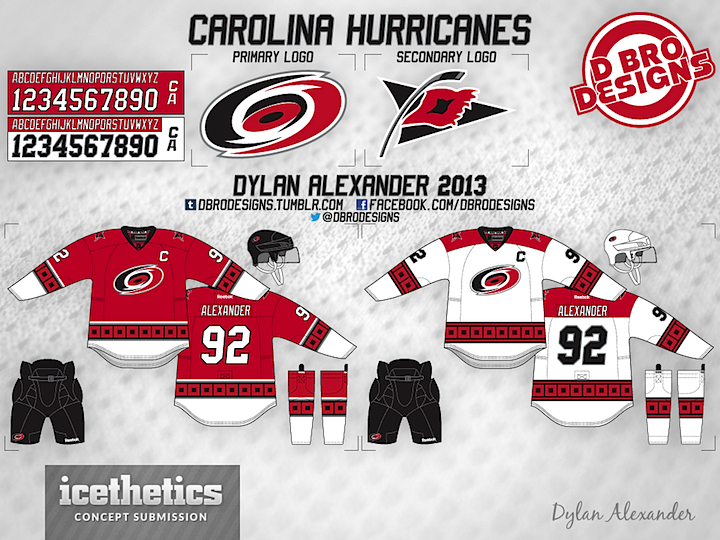 Next, we have Dylan's attempt at fixing the Hurricanes' new uniforms. He proves it's really a simple task. Put the storm flags back! As a bonus, here's a college concept for the University of North Carolina. Dylan's done an awesome job giving the Tarheels a makeover. Looking forward to seeing what he tackles next.